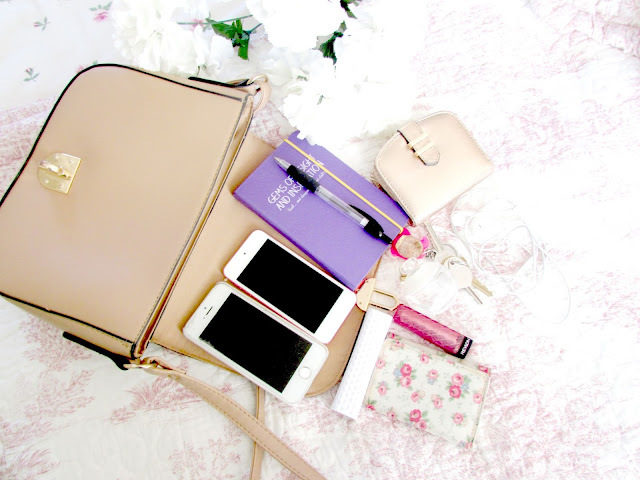 If you have read my previous 'What's In My Bag?' post which I think was around December time then you can see I've downgraded in size. As much as I love that other bag it's too big and bulky to carry around in the Summer time. This is a really nice size and even though it may not look it I actually carry a lot around with me. Before I start though this is everything that was currently in my bag. I didn't add nor take out anything except for old tatty receipts and coins at the bottom of my bag which are now in my purse! So what is in my bag? iPhone: For tweeting, catching up on blogs, talking to friends and of course instagramming my ever move! Headphones: My day is instantly ruined if I forget these. Must listen to music! Notebook & Pen: For jotting down thoughts for blogs and also anything new that I need to remember at work. 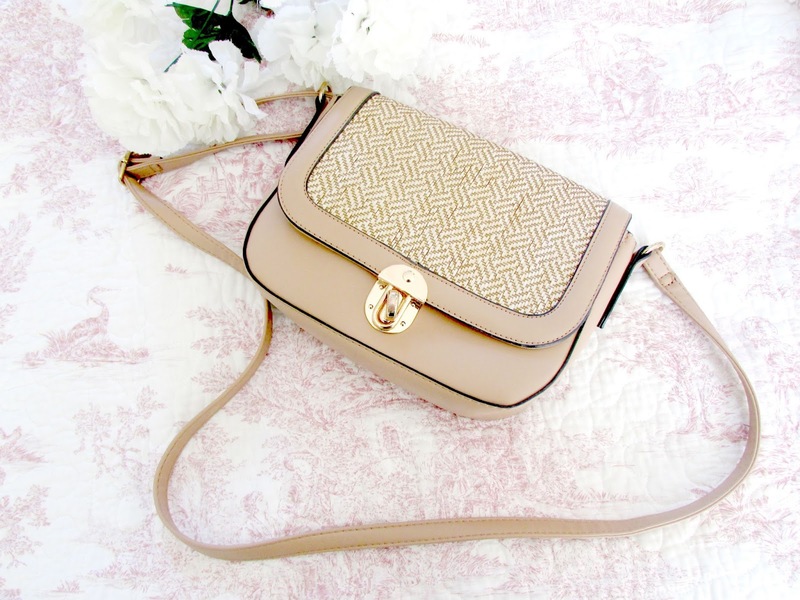 Purse: Now I have two purses and I tend to swap between them depending on my mood. At the moment I'm using this gorgeous rose gold purse that I got from New Look. In there I keep my cards and money and it's just slightly smaller and easier to carry around. Oyster Card: I can't travel anywhere without this so it's a handbag staple! Revlon Lip Butter: I literally can't live without my Revlon Lip Butter so there's always one in my bag. Keys: Well I don't want to be locked out now do I? Mini Perfume: So I can smell nice and avoid the dreaded BO stench on tubes and buses in London! Ever want to just whip out your perfume and spray every person in sight on public transport? Portable iPhone Charger: My brother bought me this the other week and it has come in so handy well apart from the times I forgot to charge the portable charger but you get my drift! TicTacs: For minty fresh breath! OR sometimes Apple scented breath as I'm a little obsessed with the apple flavored tictacs. I had run out though which is why they aren't pictured! Chewing Gum: Serves the same purpose as above all though I can't really fit the tubs of gum into this bag so I tend to just stick with the tictacs. A book: Now this was the new Giovanna Fletcher book called 'Dream A Little Dream' however I finished it so it will be replaced with a new book by Lindsey Kelk called 'Always The Bridesmaid' which I can't wait to tuck into. Water: Definitely need to start drinking more H20 but sometimes if I have enough room there's a bottle in there. Deodorant: I took it out my bag for use after my shower this morning but I keep it in my bag all the time. Snacks: Sometimes not the healthiest other times really healthy! I'm loving the little graze snack pots available from WHSmith's at the moment. Tasty and nutritious! Umbrella: Yes I know it's summer but the UK summer is a very unique one. An umbrella always needs to be close to hand no matter what time of the year it is! So that's all the things I'll be carrying in my bag this summer! I'm definitely on the look out for a new bag for the Autumn/Winter months fast approaching so if you have any recommendations please leave them in the comments below as I would love to have a read. What do you carry around in your bag? If you have done a video or post like this be sure to link it in the comments section below so I can have a read. beauty and lifestyle blogger, FleurDanielle, Summer Edition, What's In My Bag? 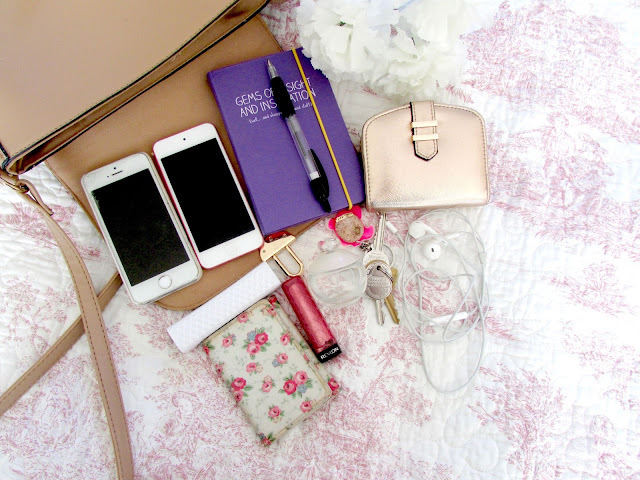 I also love reading bout and watching what other people carry in their handbags ;) . That purse is adorable, btw. Absolutely love your bag, I may have to try and hunt it down! You are so much more prepared with what's in your bag than I am ahah! Literally all I bring out with me is my purse, headphones, iPhone, keys, and a pen! I love what's in my bag vids too, so fun to have a nose round other people's handbags! Your bag is so summery and cute, and I was JUST thinking I hadn't bought a new bag this entire summer, which I think deserves a reward lol ;-) What shade of Revlon lip butter do you like? I had one but found it too sparkly for me, just curious if they are all so sparkly?